Yesterday’s press conference with Seattle Mayor Mike McGinn and King County Executive Dow Constantine went exactly as expected. They talked about how excited they were to have a workable arena proposal in front of them, and that it wouldn’t involve new taxes. For one, their main talking points were about how this deal doesn’t happen until teams (NBA and NHL) are acquired. 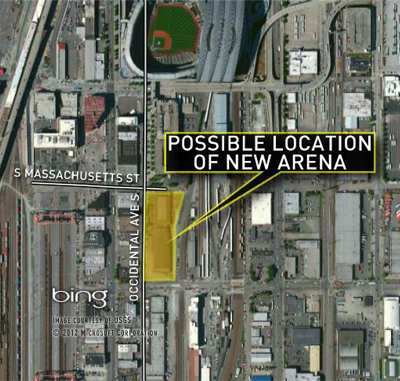 We’ll take a look at the proposed financing of the new arena, after the jump. According to Mayor Mike McGinn the new arena will cost somewhere in the area of $450-500 million. McGinn also stated that Hansen and his group were willing to put forward $290 million for funding the arena, according to Constantine that would make this arena the third highest private investment in NBA Arena history (Hansen and his group will also pay for cost overruns, they will also make up any shortfalls in the arena’s operation). The rest of the arena would be paid for by bonds floated out by the City of Seattle and King County. These bonds would be paid back by taxes on the arena, admission and land taxes placed on the arena. Another important factor that McGinn and Constantine hit on was that not a single cent of public funds (the bonds) will be placed towards the arena until Hansen and his group put their money towards the arena down. And Hansen won’t put money towards an arena until he has a team. However, let’s be honest here, there is almost no way this entire process has gone this far without Hansen feeling pretty sure that he can acquire a team. I have a feeling that the teams are all we are waiting on. In my previous article, I pointed out that the League owned Phoenix Coyotes (formerly the Winnipeg Jets) are the NHL team that have been listed as a team that could find their way up to Seattle if this arena deal goes through. The NHL has expressed interest in Seattle in the past. 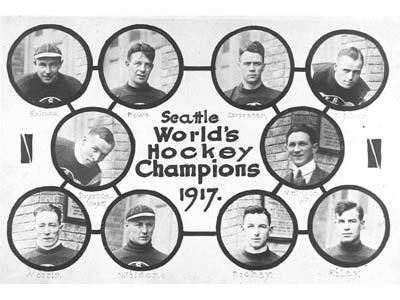 And why wouldn’t the NHL want to return to the first American City to win the Stanley Cup (the 1917 Seattle Metropolitans beat the Montreal Canadians)? As for the NBA the situation is a little less clear. The Sacramento Kings (formerly Rochester Seagrams, Cincinnati Royals, and Kansas City Royals) have been located in Sacramento for 27 years. Their owners are losing money and the team is in need of another arena. NBA Commissioner David Stern has placed a March 1st deadline for the city to come up with a way to fund a new arena. The other possible team that could come up to Seattle is the financially struggling (and league owned) New Orleans Hornets (formerly the Charlotte Hornets). McGinn said he wasn’t in the prediction business and he wouldn’t speculate on who could become the new Sonics. Constantine and McGinn sounded really excited about this new arena possibility. And they should be. This is a historic opportunity for the City of Seattle to right a wrong that was wrought upon them by Clay Bennett and his goon David Stern. However, this opportunity to right that wrong WILL wrong another city, another fan base. And will embitter more sports fans for generations to come.